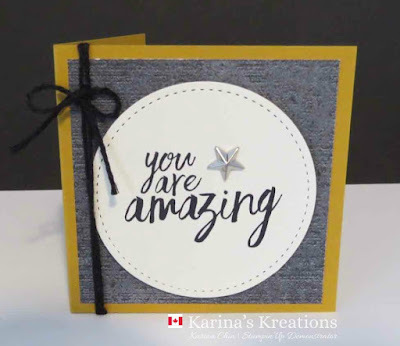 I love the All Things stamp set #143097. It's perfect for a variety of occasions and I love how it coordinates with the Stitched shapes framelits dies #145372. I made this card for my friend who had the highest sales on my team in January. The card used Urban Underground Designer Series Paper #142783 and Urban Underground Embellishments #142786. The Stampin'Up starter kit is on sale until March 31. 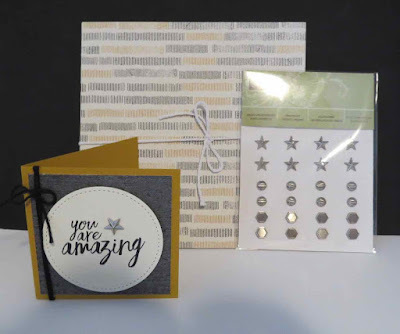 It's $135.00 and you receive $165.00 in product plus 2 bonus stamp sets. You get FREE shipping and FREE Gst on this order.